Arctic Sea Ice about to hit ‘normal’ – what will the news say? | Wott's Up With That? “Arctic Sea Ice about to hit ‘normal’ – what will the news say?” “Hah!” says Anthony Watts. 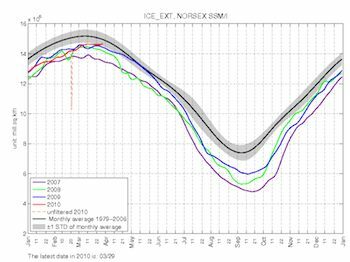 The Arctic sea ice is about to recover all the way to “normal”. That’ll show those Catlin Arctic Survey folks with their tents and sleds! Arctic sea ice extent on March 29, 2010. Anthony ignores that the variability is mostly in summer. Arctic Regional Ocean Observing System. This entry was posted in Half of the Story, Just Keep Saying It, Numbers are Tricky by Ben. Bookmark the permalink.